A Bayou/Bay fishing charter in the waters off Galveston Tx is a completely unique experience. The day begins in the brackish backwaters of Galveston Bay where black bass and catfish abound. If we’re lucky, we might even catch sight of an alligator or two. Our destination, however, is the warm waters of the saltwater marsh and bay. Here we find some great fighting fish. Redfish, trout and flounder all feed in these quiet waters, making this the perfect spot to drop a line. A Galveston Bayou/Bay fishing charter offers anglers the thrill of the chase and the chance to do battle with some awesome marine warriors even on days when the weather is too rough to take to the open water. Since many of the Gulf’s toughest fighting fish spawn, feed and shelter from rough seas in the shallow water of saltwater marsh and Galveston Bay, you are sure to have the experience of a lifetime landing these big beauties.Captain Greg Verm knows these waters well and never tires of telling stories about growing up on the bayou, stalking tailing redfish and chasing schools of trout and flounder. 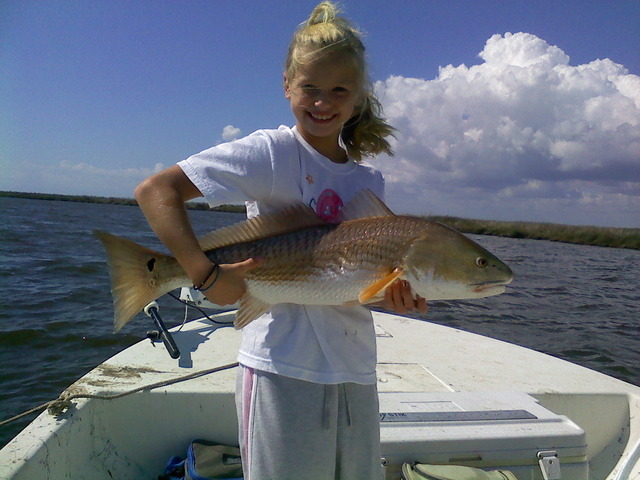 Young or old, novice or pro, when it comes to great fishing you can’t beat a Galveston Bayou/Bay fishing charter. Naturally protected from the elements, the calm waters of the Galveston saltwater marsh, bayou and bay provide the perfect setting for a day on the water without the discomfort of rough-water sea sickness. Captain Greg is especially enjoys introducing kids to the excitement of sport fishing, so a Galveston Bayou/Bay fishing charter makes a great, one-of-a kind family outing you’ll never forget. Contact us today to book your Galveston fishing charter. Half Day (5 hours) for up to three people: $550 – $75 for each additional up to six max. Full Day (8 hours) for up to three people: $750 – $75 for each additional up to six max.